After 57 team events in June we took a trip to @JamieMusical and have talked about nothing else since! It’s no secret that top of a Glitterbox CV is a love of musicals. So we’ve since followed the show’s innovative #workofart competitions, in association with @BarryMCosmetics . What a glorious, glittery campaign – our favourite kind of experiential marketing . We’re busy concocting our own entry, with our favourite bio-degradable glitters from our friends at Eco Stardust. We even took our new products as far as Sweden, thanks to Couture Events, who brought our team on board for an exceptional neon glow party for several thousand guests. The staff at O2 were treated to a glittery treat during their national office away days, spanning London, Manchester and Edinburgh, under the stage management of their event team at Sledge. We were back in The Queen Elizabeth Olympic Park‘s Copperbox for Surrey Storm netball champs. It was blue and silver glitter for them and red, white and blue for their rivals, Loughborough Lightening. 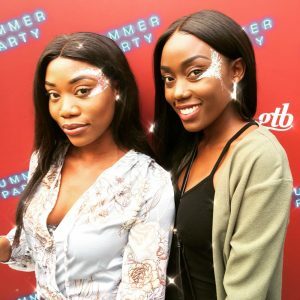 We also returned to London South Bank University to glam their students for a Summery Festival Party. The opening of St Albans Museum drew huge crowds and wonderful press reviews, for its superb newly designed spaces, inviting cafe and imaginatively-curated exhibitions. 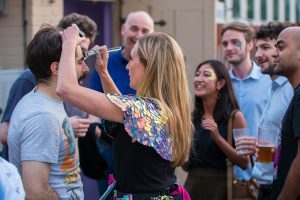 Then came the highly anticipated return of St Albans Film Festival, where we painted the kids at the open air cinema and the adults at the closing party. We headed to Hoxton for a party hosted by The Crown and Shuttle for their punters, and also to our regular, The Queen of Hoxton. A 20th Anniversary party for MJ Mapp took us to a new venue, The City Summer House which had a fabulous holiday vibe, and our buddies at Dishoom hired our gang for their Eid party at Dinerama. London’s River Island hired us for a touch of flower-power for their sixties and seventies staff party and UK Girl Guides took us south of the river, to share the cool grooves of Lost & Co Battersea . We’re still waxing lyrical about each and every wedding we’re hired for, we love it all – the laughter, the tears, the racy speeches and the rocking bands. Recent venues of note include Tewin Bury Farm and Eversholt Hall – and a special thanks to Heart Shaped Weddings for having us back to embellish more of their sumptuous occasions. Our agency friends packed our June diary with everything from a 1st to a 50th, plus Bar Mitzvahs, Bat Mitzvahs and weddings. For Chaika Events we also provided glitter braids, which are proving hugely popular lately. 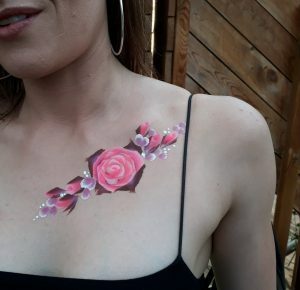 White Paper Events brought us on board for flash tattoos and white henna transfers, which were a very classy and photogenic offering. Snug Events brought us back for a lavish annual garden party in Hertfordshire and Private Drama asked us to paint some small guests at The Serpentine Gallery. 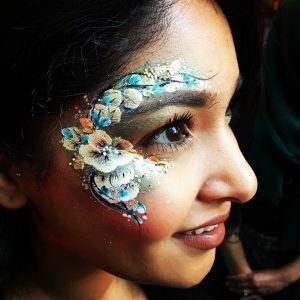 Ten Thousand Hours Agency hired a large team of artists for a private corporate festival, held within stunning National Trust grounds. We’ve also continued to enjoy a number of bespoke Dazzle & Fizz parties, across West London & Surrey. Out There Events invited us to glitter one of our favourite venues, Old Billingsgate , for the Mixology Awards. Then Ultimate Experience and Full Circle hosted some head-turning events at The Pavillion at The Tower of London. 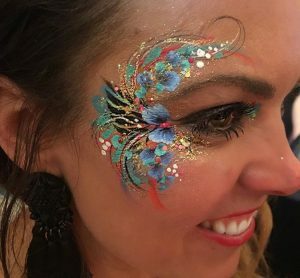 There was a festival-themed Away Day for GiffGaff and we loved glittering the inspirational guests of Starlight Children’s Foundation. Closer to home we were a participant of the Harpenden Collective Pop-Up Festival, Aldenham School Summer Ball and the family-friendly Alban Street Party. Next up are Summer parties for the staff of Dishoom , Deliveroo , KP Snacks, Warner Bros, PRS Music and Jet2Holidays. We hope we might see some of you there for a touch of pizazz. Image credits: Kellie, Kellie, Kellie, Louisa, Gwen.